This year, October 31 was more than just Halloween. It was also the first global celebration of Dark Matter Day. In 25 countries, 11 US states and online, people interacted with scientists, watched demonstrations, viewed films, took in art exhibits and toured laboratories to learn about the ongoing search for dark matter. Symmetry has collected a series of photos from participants around the world. 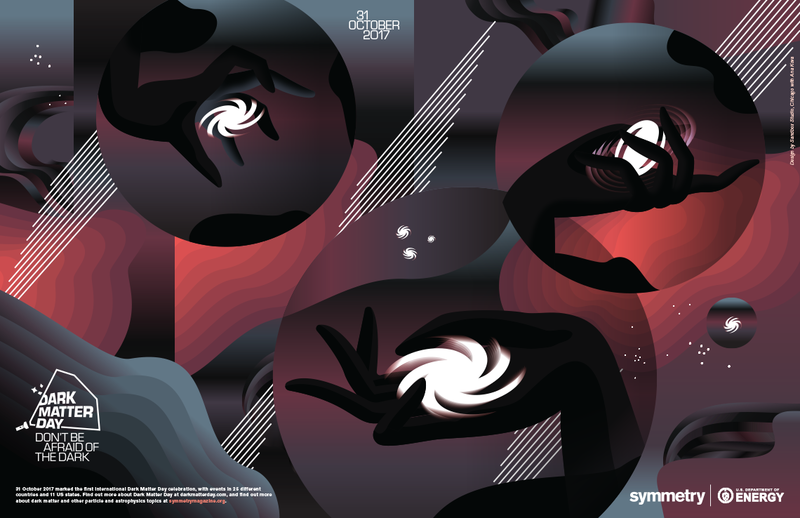 Check out how people celebrated Dark Matter Day and download a commemorative dark matter poster (to be printed using visible matter). Actress Tilda Swinton narrated the planetarium show, which audiences around the world viewed at different Dark Matter Day events. In a talk after the planetarium show in Strasbourg, visitors were jokingly warned never to challenge a theorist. Speaker Pierre Van Hove, a physicist based at Institut Pluridisiplinaire Hubert Curien (IPHC), discusses the search for dark matter at the Large Hadron Collider after the show in Strasbourg. Visitors approach Van Hove, who is on the CMS experiment at the LHC, after the talk. Peter Sorensen of Berkeley Lab gave a talk at the California Academy of Sciences in San Francisco on October 31. Employees at SLAC National Accelerator Laboratory celebrated Dark Matter Day with Facebook Live broadcasts related to two upcoming projects that will study dark matter, the LZ experiment at the Large Synoptic Survey Telescope. Bart Bernhardt, co-founder of Nerd Nite SF, donned a Dark Matter Day t-shirt during an October 18 event in San Francisco. Obi-Wan Kenobi was spotted in a Dark Matter Day t-shirt in the Berkeley Lab Strategic Communications office. School children made their own dark matter particles during a workshop at STFC’s Rutherford Appleton Laboratory in the UK. The auditorium was packed for a special “Talking Science” public lecture at STFC’s Daresbury Laboratory. In a Parliamentary showcase at the House of Commons, MPs met with leading UK dark matter experts (L-R): Tommy Sheppard MP, Carol Monaghan MP, Prof Carlos Frenk, Patrick Grady MP, Prof Alex Murphy, Prof Sean Paling, Prof Martin Hendry and Dr Brian Bowsher. Dark Matter Day event in Victoria Street, London. (L-R) Sean Paling, Director of the Boulby Underground Laboratory, with Greg Clark MP (Secretary of State for Business, Energy & Industrial Strategy), Dr Laura Manenti, and Prof Carlos Frenk. The interest of the public in Karlsruhe, Germany, was so great that the NTI lecture hall on Campus South was filled to the last seat and no standing room was available. Two Karlsruhe Institute of Technology researchers summarized scientists’ current understanding of dark matter and talked about new experiments seeking to uncover its mystery. The German laboratory DESY turned into an art gallery for Dark Matter Day. Fifteen artists took part, showing works they created after an intense period of exchange with DESY scientists. The artwork at DESY included a sound installation in the HERA accelerator tunnel. The dark matter artwork at DESY was displayed in test halls, accelerator shafts and office corridors. On Dark Matter Day, the other works were topped off with a program of short films called “Dark Matters” and a live link to the CMS experiment at CERN. The Institute of High Energy Physics, Chinese Academy of Sciences and Shanghai Jiao Tong University organized an event in Shanghai. Visitors lined up outside the Dark Matter Day event in Shanghai. The event in Shanghai began with public lectures followed by free discussion between the public and the scientists. Dark Matter Day at CERN included a dark matter cake. Katharine Leney, a researcher on the ATLAS experiment at CERN, introduced the evening by presenting the basic principles of dark matter using her bespoke dark matter cake. Later in the evening Wessel Valkenburg, a research fellow in the Theory Department at CERN, explained the how and why research is carried out on dark matter. More than 270 attendees onsite as well as on the live webcast learned from CERN experts about the experiments and theories that seek to provide us with a deeper understanding of this strange and unknown matter. A volunteer demonstrated electrical repulsion at a Dark Matter Day event at Adler Planetarium in Chicago. A jar of jellybeans at the Adler Planetarium event represented the make-up of the universe, mostly dark energy and dark matter. Visitors and volunteers talked particle accelerators at the Dark Matter Day event at Adler Planetarium in Chicago. On October 24, Brookhaven Lab took three dark matter experts to a local bar for some lively conversation over food and drink. Participants at Brookhaven Lab’s Dark Matter Day “PubSci” event interacted with Paul Stankus of Oak Ridge National Laboratory, Neelima Sehgal of Stony Brook University, and Paul O’Connor of Brookhaven—with science communicator Justin Eure serving as master of ceremonies. For Dark Matter Day at Sanford Lab, James Haiston Jr. (aka Quailman) and Jack Genovesi (aka Jack-in-the-Box) of the South Dakota School of Mines and Technology donned Halloween costumes to reprise a recent Comic Con panel on dark matter and its role in popular culture. “Everything we know about the universe—regular matter and energy—accounts for a fraction of the universe,” said Michael Dowding (aka Mr. Incredible) of the South Dakota School of Mines and Technology at Sanford Lab's Dark Matter Day event. Berkeley Lab scientist Dan McKinsey participated in a Reddit AMA about dark matter. Kathryn Boast of University of Oxford’s Department of Physics tweeted this photo of a Dark Matter Day jack-o’-lantern. China Science & Technology Museum hosted a Dark Matter Day event on November 5. Four hundred people attended in person, and more than 50,000 people watched the online broadcast of the talks. Science lovers of all ages attended the Dark Matter Day event in Beijing. Video: Ask Symmetry—How is the Force like dark matter?